rainfall recorded at the hatchery during the month was 42.5 mm. ova for grow out @ 83% fertility success rate. been reached. Brown Trout stripping has been completed. picking has begun and the ova fertility success rate appears to be high. The Thredbo river is looking good at the moment the best place is at paddy’s corner down to the bridge most fish have gone past the Hatchery that’s where you will find most off the rainbows. things are looking better then last year thank god. The Eucumbene river is running well reports have been all down around Providence with rainbows schooling up at the mouth off the river there has been reports off fish up higher again things are looking better then last year. As always Glow bugs and Nymphs will be the flies to use this weekend good luck and have fun. Just thought I'd sent through a quick pic of a nice brown I picked up at eucambene on Friday. He was cruising a steep ledge moving towards a shallower bay when I spotted him and picked him up on a purple tungsten head bugger. Lake looks great, can't wait for it to warm up a bit! 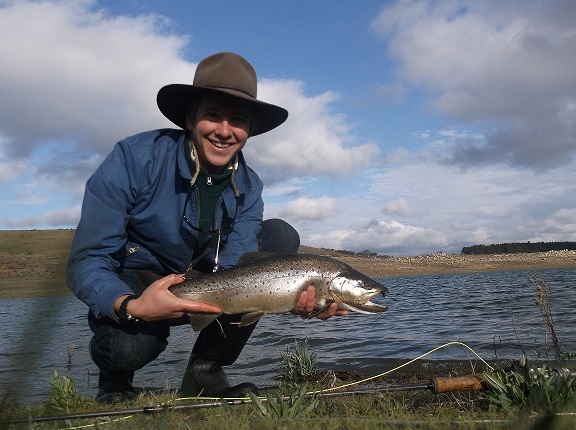 FLY FISHING EUCUMBENE & JINDABYNE things are starting to look good around the lakes with good reports off fish rising late in the afternoons and into the night..